Buffy Enochs, State Sen. Bob Peterson, and Chuck Stackhouse were in attendance at the annual 2019 DD (Developmental Disabilities) Awareness and Advocacy Day at the Ohio State House. 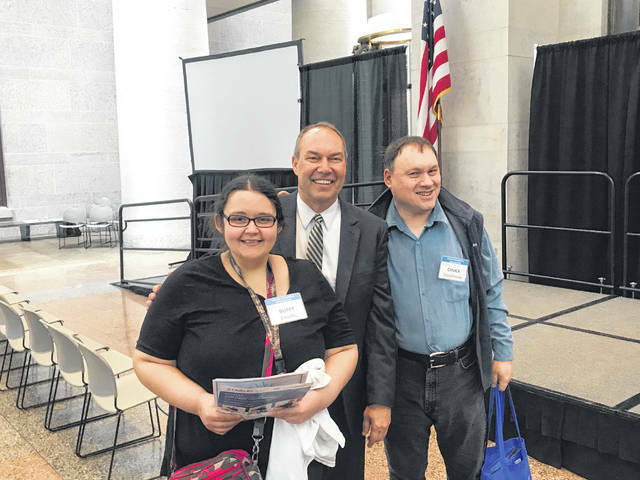 Two Fayette County advocates, Chuck Stackhouse and Buffy Enochs, recently attended the annual 2019 DD (Developmental Disabilities) Awareness and Advocacy Day at the Ohio State House. This year the theme was, “Supports Matter.” Following the morning’s agenda, Ohio Sen. Bob Peterson met with constituents from his district. Buffy and Chuck shared their concerns about the direct service workforce crisis turnover and the importance of adding more money in the budget for direct support professionals, along with concerns about the lack of transportation for people with disabilities. For more information about the programs and services provided by the Fayette County Board of Developmental Disabilities, call 740-335-7453, visit www.fayettedd.com, and follow on social media. https://www.recordherald.com/wp-content/uploads/sites/27/2019/04/web1_FACT.jpgBuffy Enochs, State Sen. Bob Peterson, and Chuck Stackhouse were in attendance at the annual 2019 DD (Developmental Disabilities) Awareness and Advocacy Day at the Ohio State House.